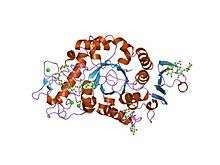 α-Amylase is a protein enzyme EC 3.2.1.1 that hydrolyses alpha bonds of large, alpha-linked polysaccharides, such as starch and glycogen, yielding glucose and maltose. 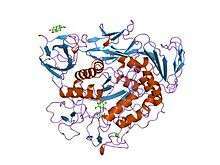 It is the major form of amylase found in humans and other mammals. It is also present in seeds containing starch as a food reserve, and is secreted by many fungi. 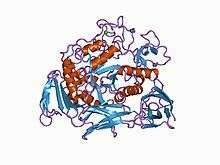 Salivary α-amylase has been used as a biomarker for stress that does not require a blood draw. ↑ Ramasubbu, N.; Paloth, V.; Luo, Y.; Brayer, G. D.; Levine, M. J. (1996). "Structure of Human Salivary α-Amylase at 1.6 Å Resolution: Implications for its Role in the Oral Cavity". Acta Crystallographica Section D. 52 (3): 435–446. doi:10.1107/S0907444995014119. PMID 15299664. ↑ Maureen Barlow Pugh, ed. (2000). Stedman's Medical Dictionary (27th ed.). Baltimore, Maryland, USA: Lippincott Williams & Wilkins. p. 65. ISBN 978-0-683-40007-6. ↑ Voet, D., & Voet, J. G. (2005). Biochimie. (2e éd.). Bruxelles: De Boeck. 1583 p.
↑ which was named by Swedish chemist Jöns Jacob Berzelius. The name derives from the Greek word πτυω (I spit), because the substance was obtained from saliva. See: J. Berzelius (Ms. Esslinger, trans. ), Traité de Chimie (Paris, France: Firmin Didot Frerès, 1833), vol. 7, page 156. ↑ Fried, M, Abramson, S, Meyer, JH. Passage of salivary amylase through the stomach in humans. Digestive Diseases and Sciences 32:1097-1103 (1987). ↑ Rosenblum, JL, Irwin, CI, Alpers, DH. Starch and glucose oligosaccharides protect salivary-type amylase activity at acid pH. American Journal of Physiology 254 (Gastrointestinal and Liver Physiology 17):G775-780 (1988). ↑ Perry, GH, et al. Diet and evolution of human amylase gene copy number variation, Nature Genetics 39:1256-1260 (2007). ↑ Noto, Yuka; Tetsumi Sato; Mihoko Kudo; Kiyoshi Kurata; Kazuyoshi Hirota (December 2005). "The Relationship Between Salivary Biomarkers and State-Trait Anxiety Inventory Score Under Mental Arithmetic Stress: A Pilot Study". Anesthesia & Analgesia. United States: Lippincott Williams & Wilkins. 101 (6): 1873–6. doi:10.1213/01.ANE.0000184196.60838.8D. PMID 16301277. Retrieved 1 November 2013. ↑ "Falling Number – Introduction". Perten Instruments. 2005. Retrieved 21 November 2009. ↑ "The use of enzymes in detergents". Faculty of Engineering, Science and the Built Environment, London South Bank University. 20 December 2004. Archived from the original on 20 October 2009. Retrieved 21 November 2009. ↑ Ghalanbor, Z; et al. (2008). "Binding of Tris to Bacillus licheniformis alpha-amylase can affect its starch hydrolysis activity.". 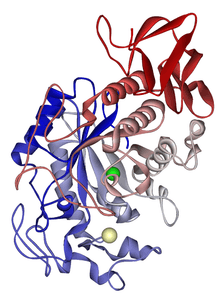 Protein Peptide Lett. 15 (2): 212–214. doi:10.2174/092986608783489616. PMID 18289113. ↑ Aghajari, N; et al. (1998). "Crystal structures of the psychrophilic alpha-amylase from Alteromonas haloplanctis in its native form and complexed with an inhibitor.". Protein Sci. 7 (3): 564–572. doi:10.1002/pro.5560070304. PMC 2143949 . PMID 9541387. ↑ Abe A, Yoshida H, Tonozuka T, Sakano Y, Kamitori S (December 2005). "Complexes of Thermoactinomyces vulgaris R-47 alpha-amylase 1 and pullulan model oligossacharides provide new insight into the mechanism for recognizing substrates with alpha-(1,6) glycosidic linkages". FEBS J. 272 (23): 6145–53. doi:10.1111/j.1742-4658.2005.05013.x. PMID 16302977. ↑ Kadziola A, Søgaard M, Svensson B, Haser R (April 1998). "Molecular structure of a barley alpha-amylase-inhibitor complex: implications for starch binding and catalysis". J. Mol. Biol. 278 (1): 205–17. doi:10.1006/jmbi.1998.1683. PMID 9571044. ↑ Kadziola A, Abe J, Svensson B, Haser R (May 1994). "Crystal and molecular structure of barley alpha-amylase". J. Mol. Biol. 239 (1): 104–21. doi:10.1006/jmbi.1994.1354. PMID 8196040. ↑ Machius M, Wiegand G, Huber R (March 1995). "Crystal structure of calcium-depleted Bacillus licheniformis alpha-amylase at 2.2 A resolution". J. Mol. Biol. 246 (4): 545–59. doi:10.1006/jmbi.1994.0106. PMID 7877175.